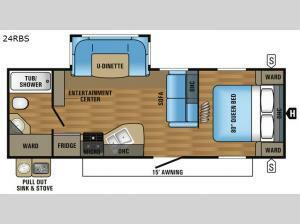 Load up the family for a weekend away in this 24RBS Jay Flight travel trailer by Jayco. A few key features that you are sure to enjoy include an outside kitchen, single slide u-dinette, front bedroom, and a rear bath. As you enter the travel trailer, the bedroom is to your right. In the bedroom you will find a queen bed and two wardrobes, and an overhead cabinet which is an ideal spot to store books. You can close the curtain for more privacy if you wish. 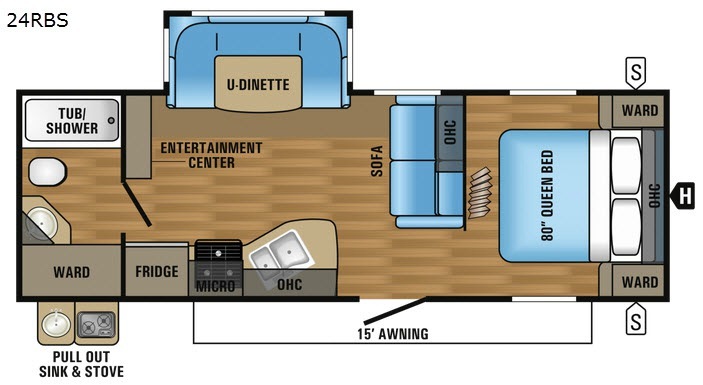 The living and kitchen area offer a sofa along the interior wall, a u-dinette slide out along the road side, and an entertainment center next to the dinette that faces the sofa. Along the opposite side the kitchen amenities include an angled countertop with a double kitchen sink, three burner range, microwave, and a refrigerator. Along the rear of the trailer there is a full bath including a tub/shower, toilet, sink, medicine cabinet, and a wardrobe. 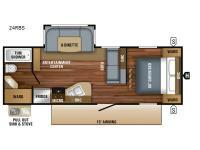 There are plenty of overhead cabinets throughout this travel trailer as well as exterior storage. Plus an outside pull-out sink and stove for cooking in the great outdoors. Outside you will also enjoy the shade that the 15' awning offers. You can even choose a free-standing table with chairs as an option in place of the dinette, and more!